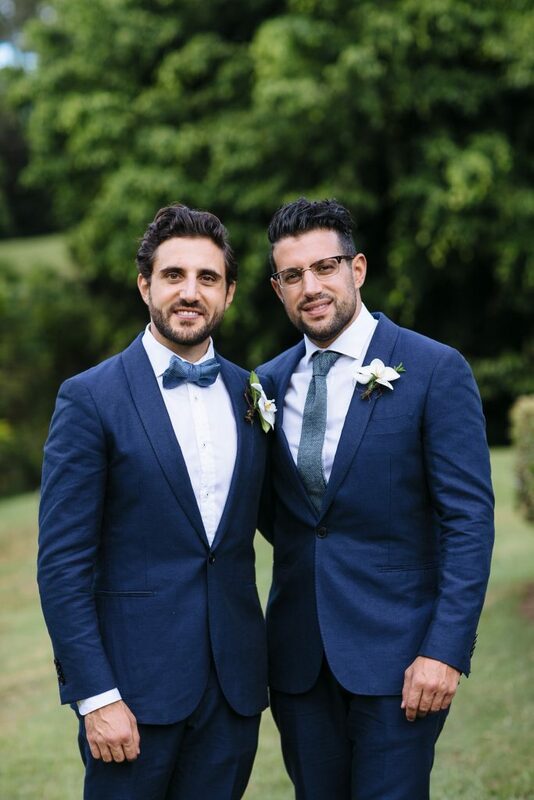 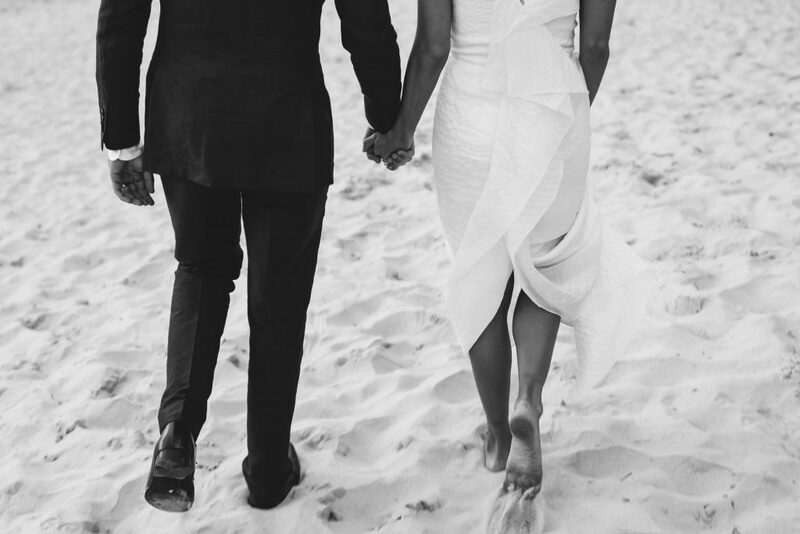 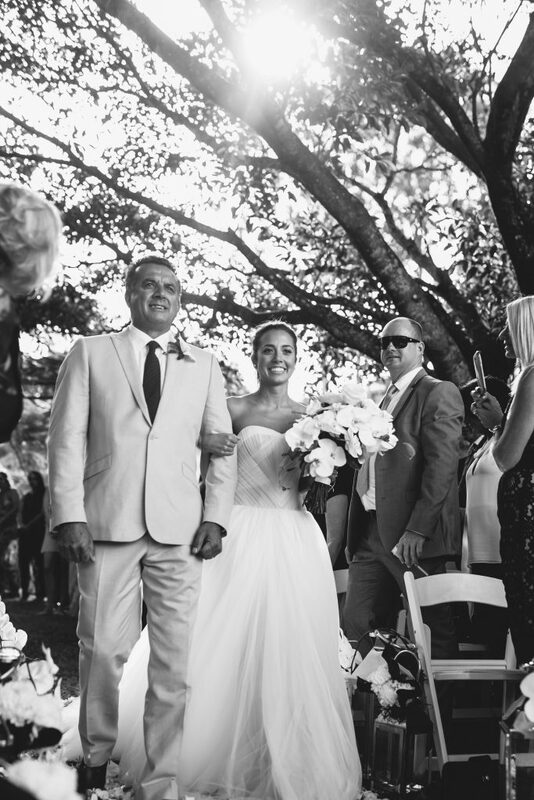 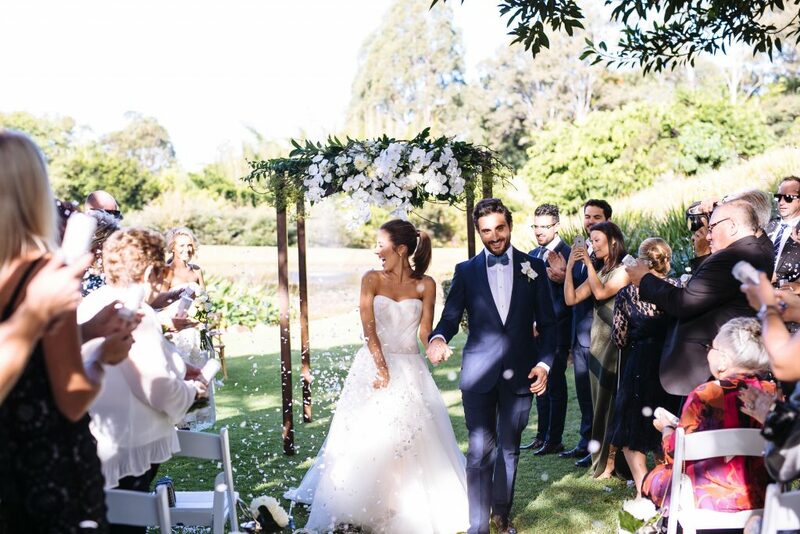 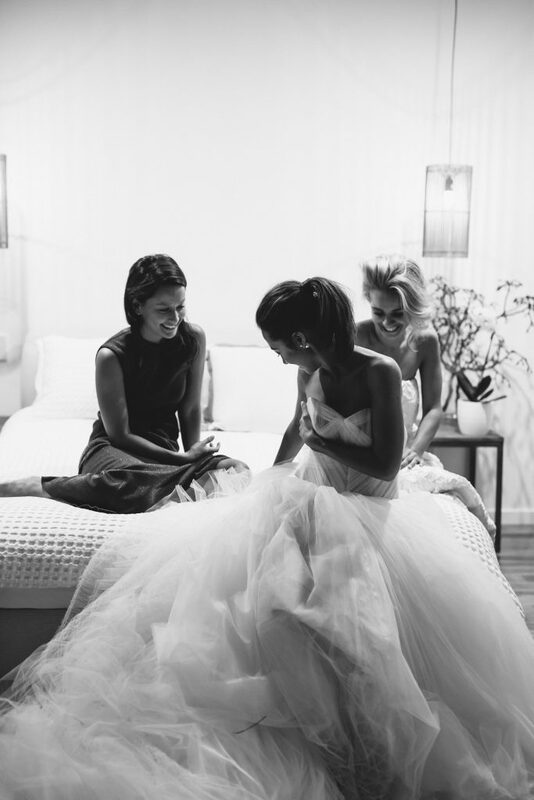 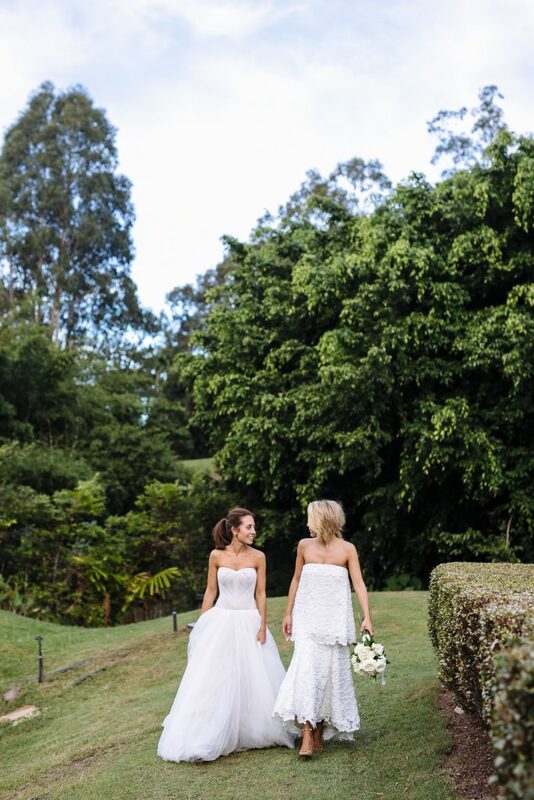 Sophisticated wedding florals featured for Tallie and Jorden’s stunning Noosa celebrations. 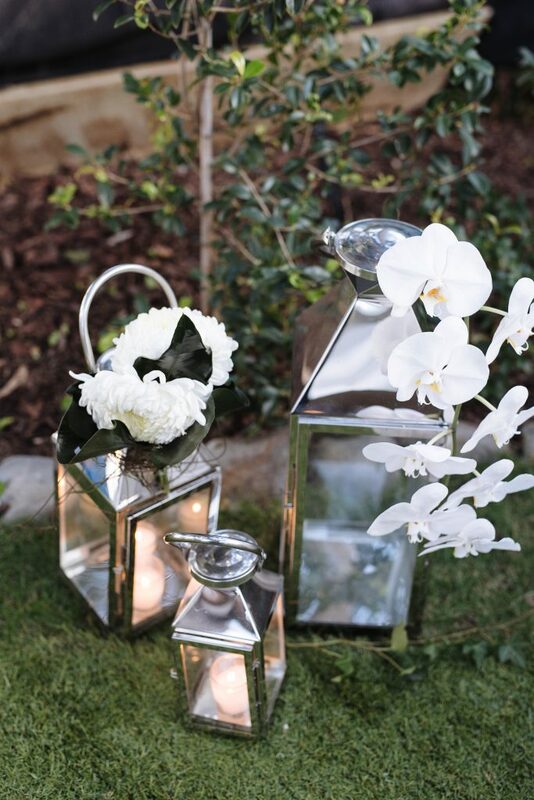 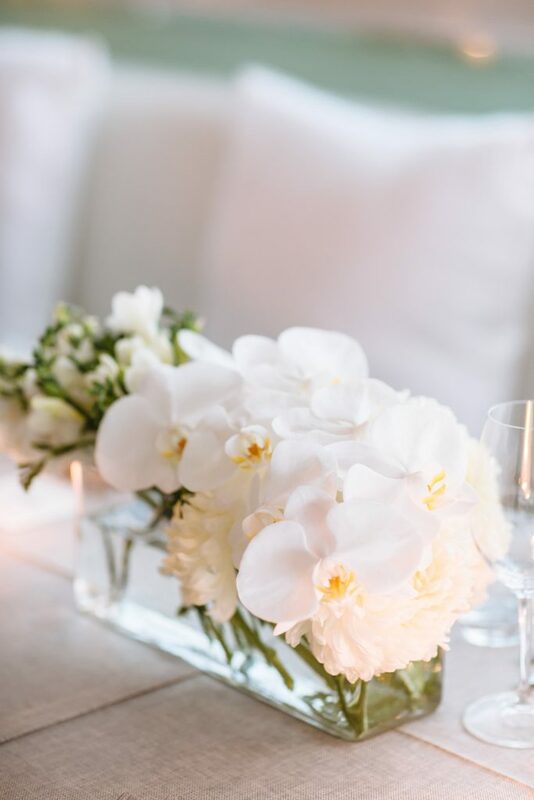 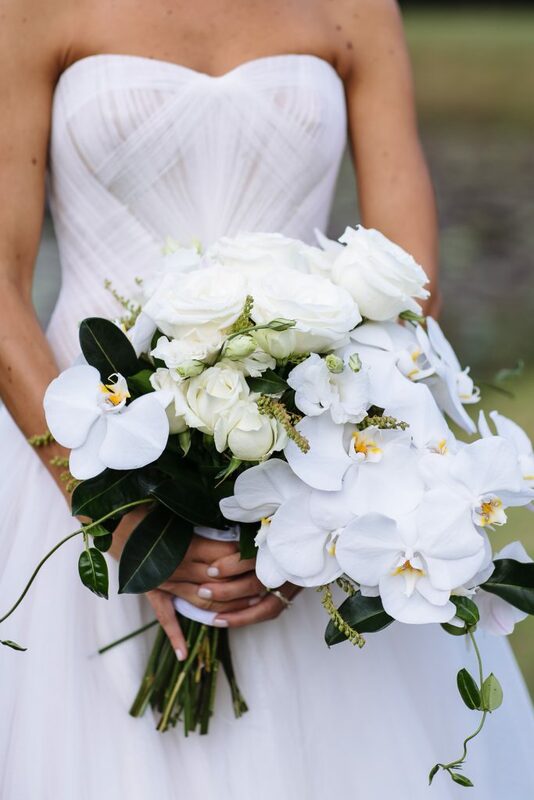 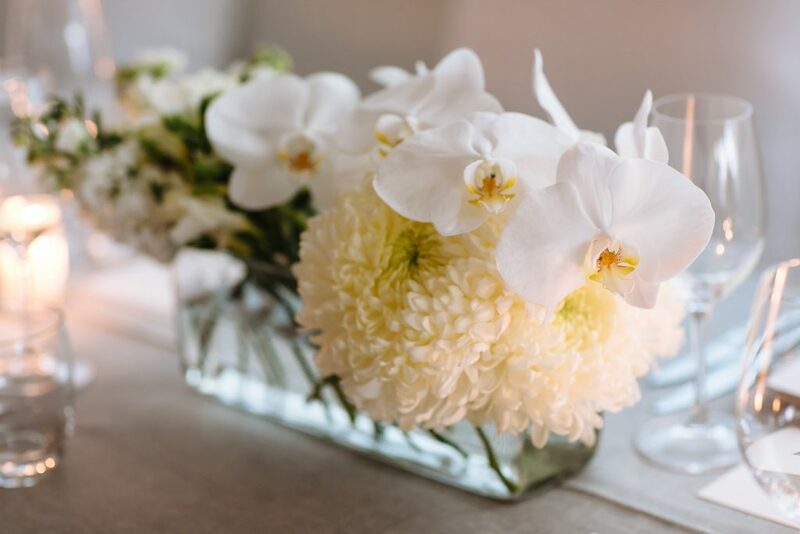 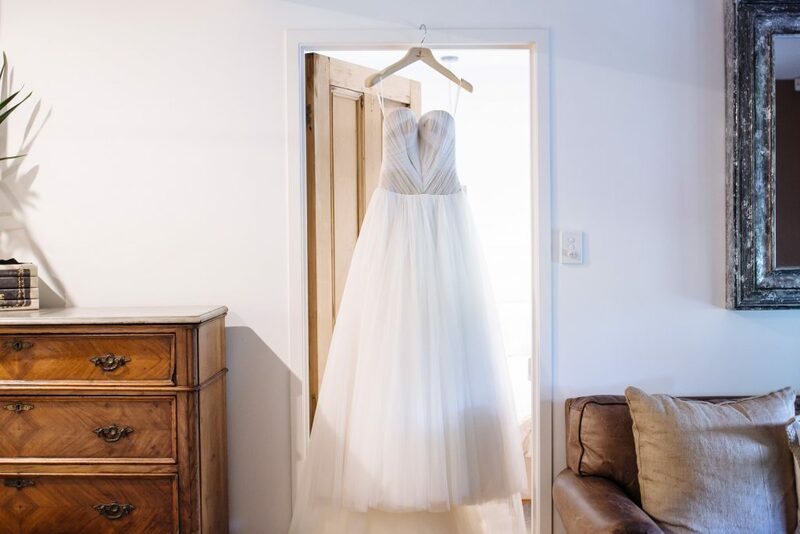 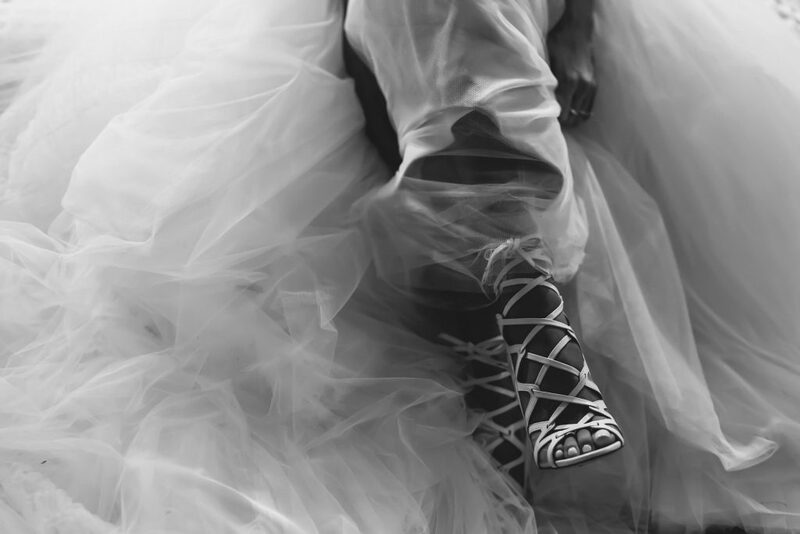 Modern chic blooms including phalaenopsis orchids, roses and oversized disbuds featured through the floral styling for this divine day, and Tallie’s effortless bridal style was the epitome of modern style. 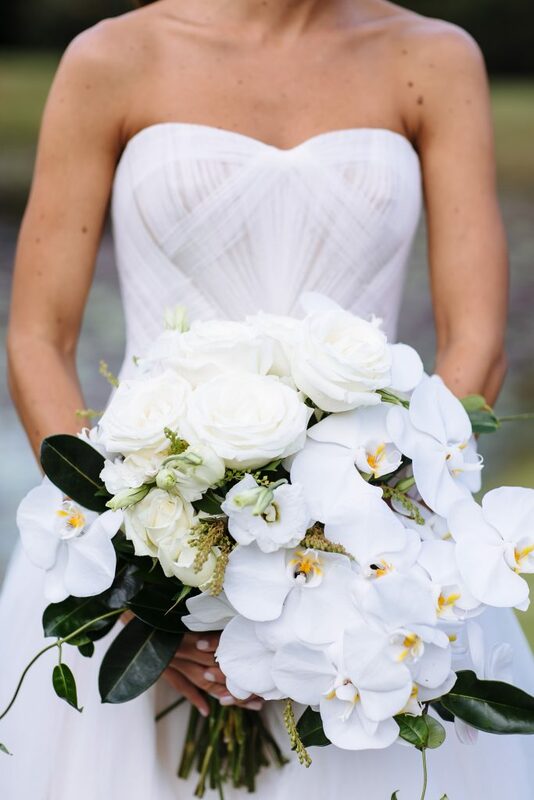 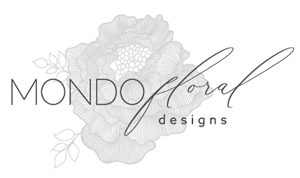 We loved creating the gathered bridal bouquet design, with touches of cascading phalenopsis orchids it was the quintessential essence of contemporary floral style! 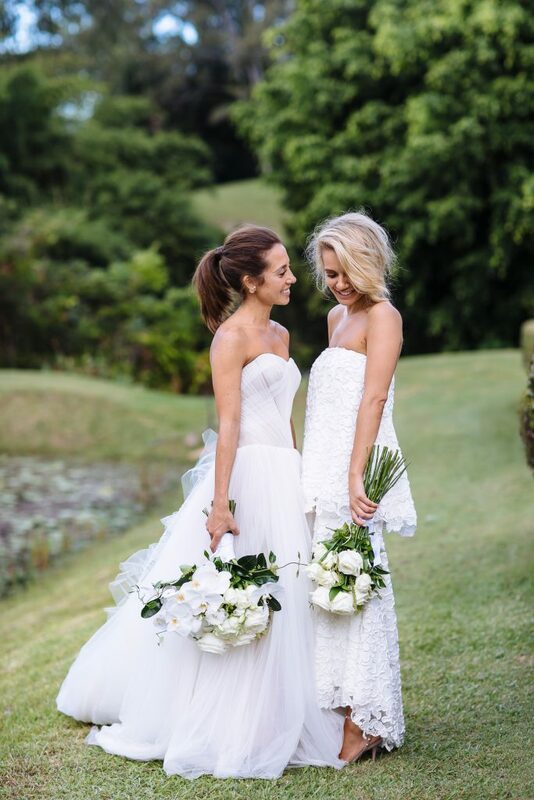 Longer stem roses featured for Tallie’s bridesmaid bouquet design and I think you will agree these two sisters oozed savvy glamorous style. 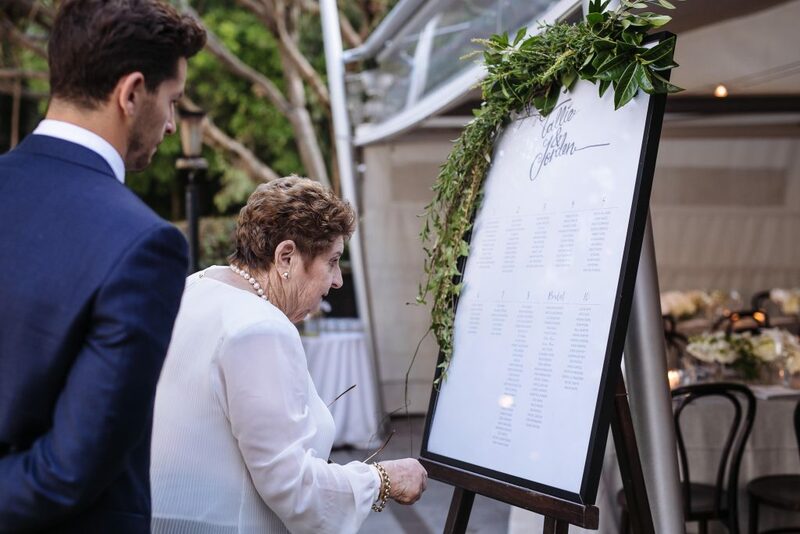 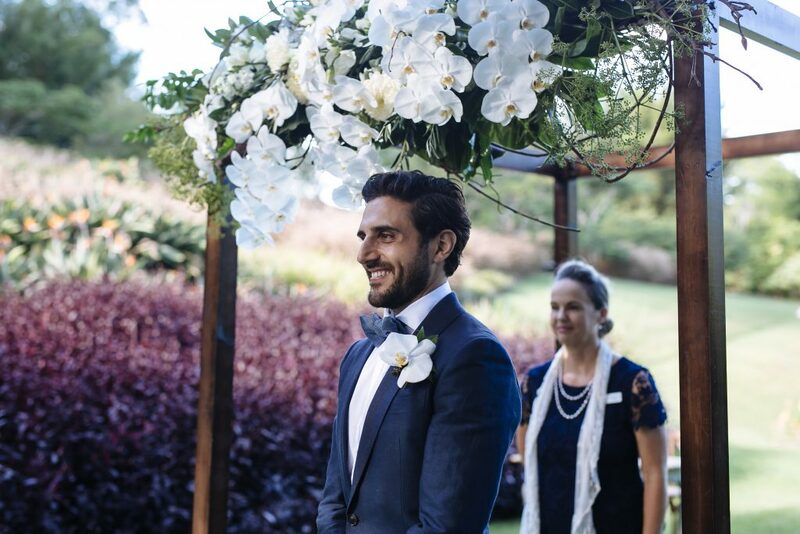 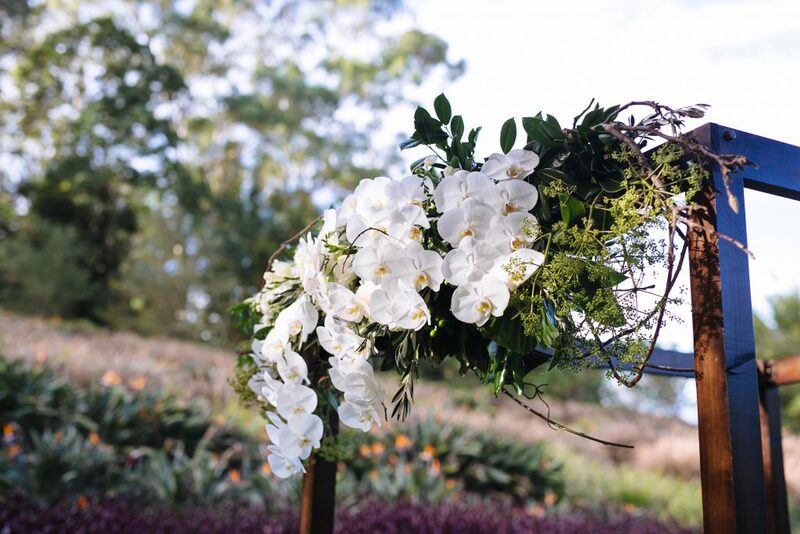 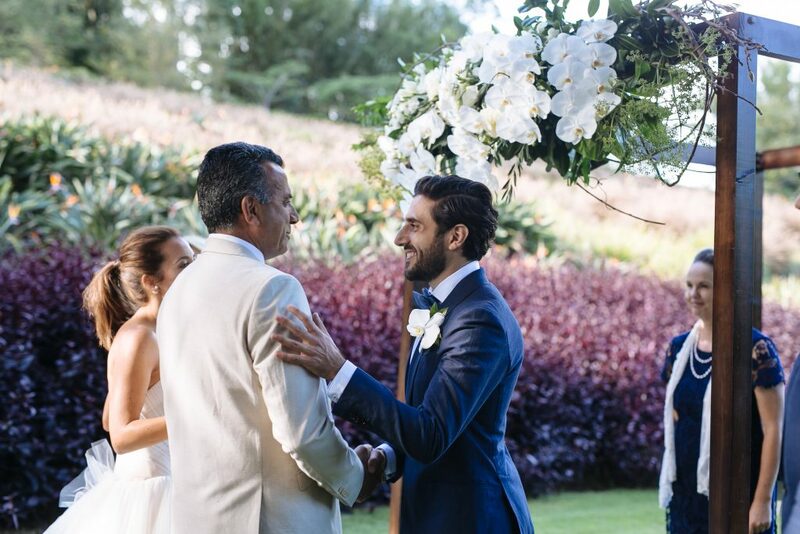 The gorgeous ceremony was hosted at the families Noosa Hinterland property and we adored creating the ceremony arbour design with phalaenopis orchids taking centre stage. 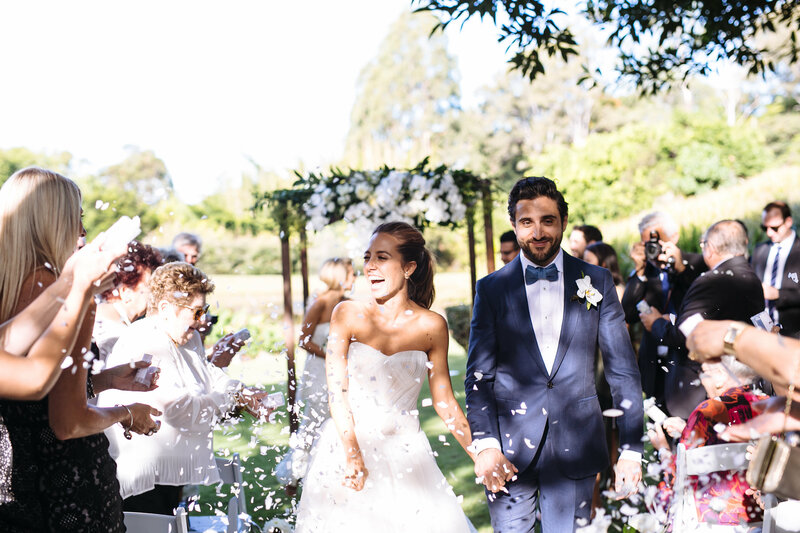 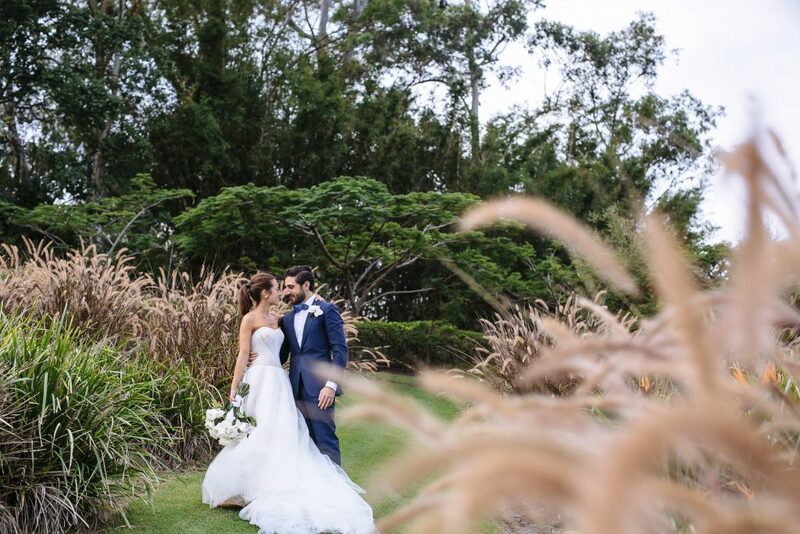 The landscaped property provided a glamorous plateau for the couple to say ‘I Do’. 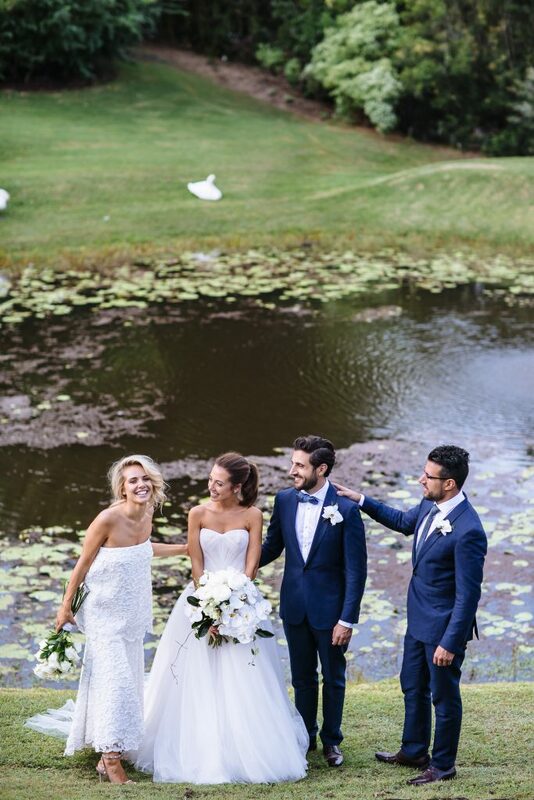 Surrounded by lush plantings, shrubs and rolling green hills, the ceremony space also featured a gorgeous water space filled with stunning white swans. 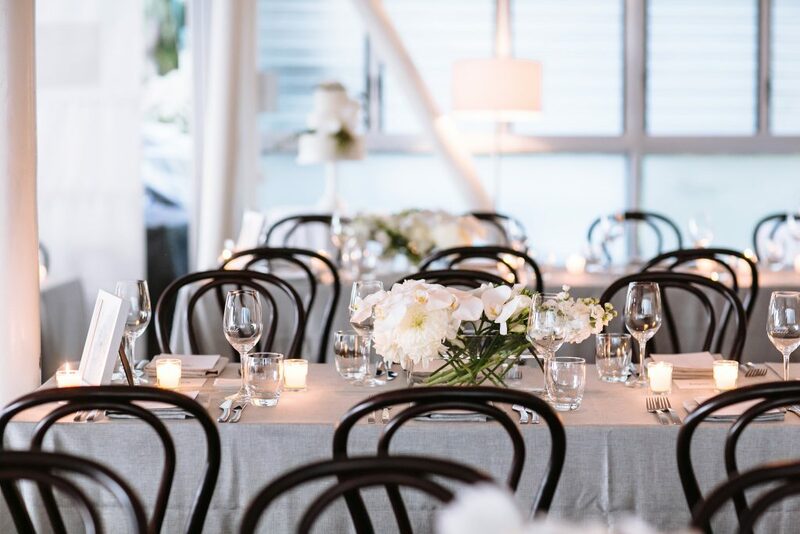 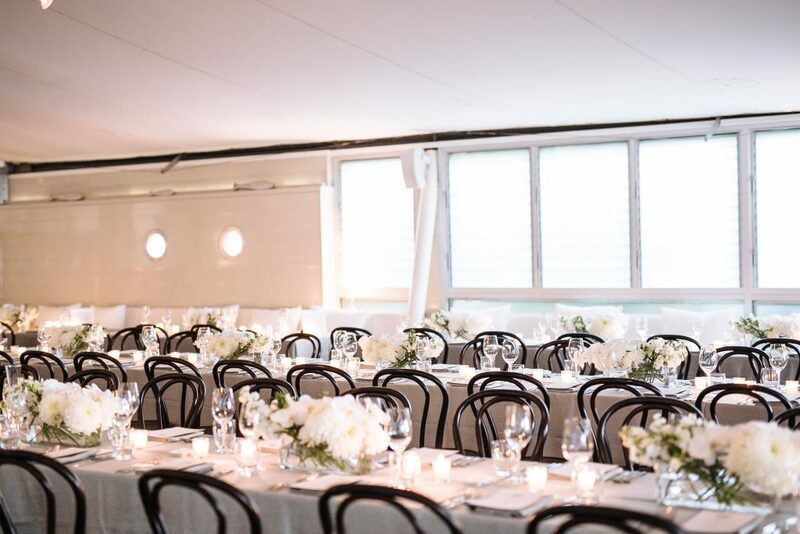 Glamourous restaurant syle continued at Noosa’s renowed beach front dining space Sails, and we collaborated with the talented team at CL Weddings and Events to create an uber modern dining celebration. 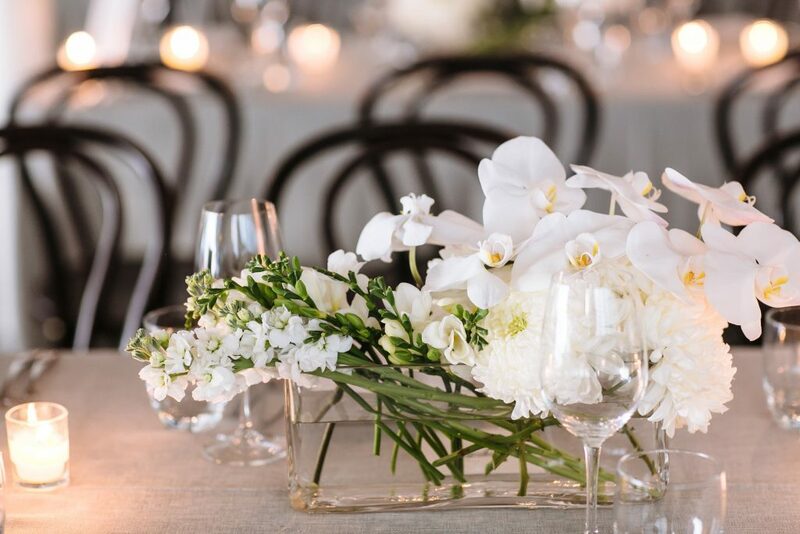 Long tables with luxurious charcoal linen and ambiant candle light accented our contemporary trough style vases of orchids, stock and disbuds. 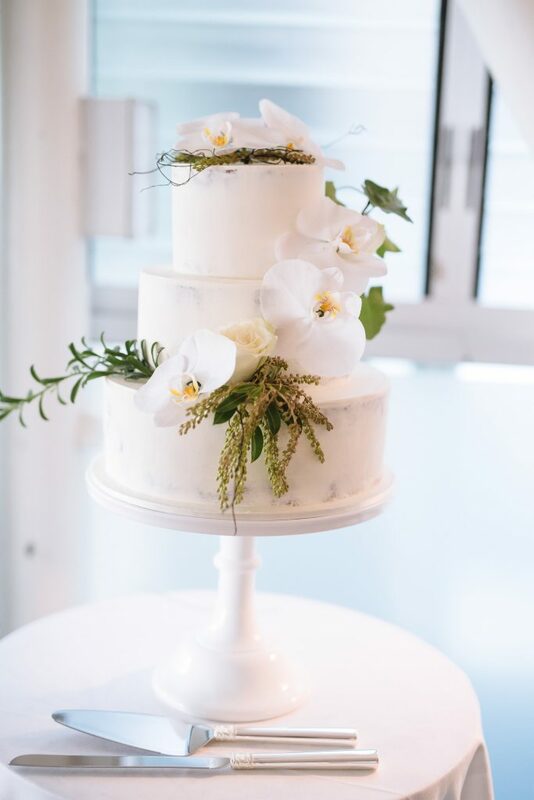 The gorgeous contemmporary wedding cake created by Cake Designs also provided us with an opportunity to add a touch of floral to the modern dessert design. 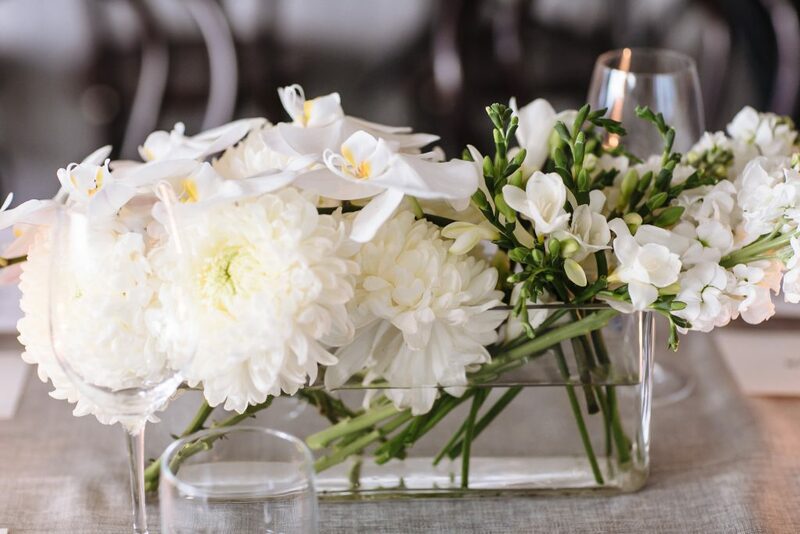 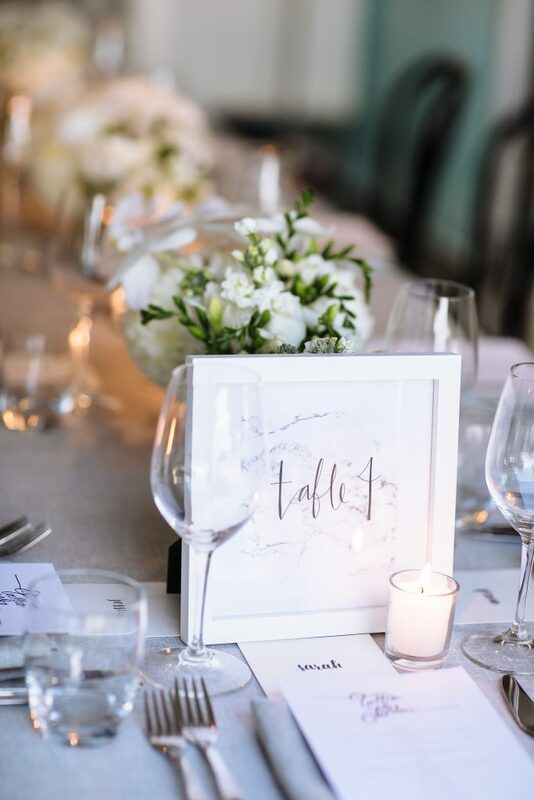 The elegant sophisticated dining space featured clean contemporary styling, the longer style rectangular style glass vase created low floral features and the collaboration of modern coastal wedding flowers created a glamorous floral accent throughout the stunning restaurant. 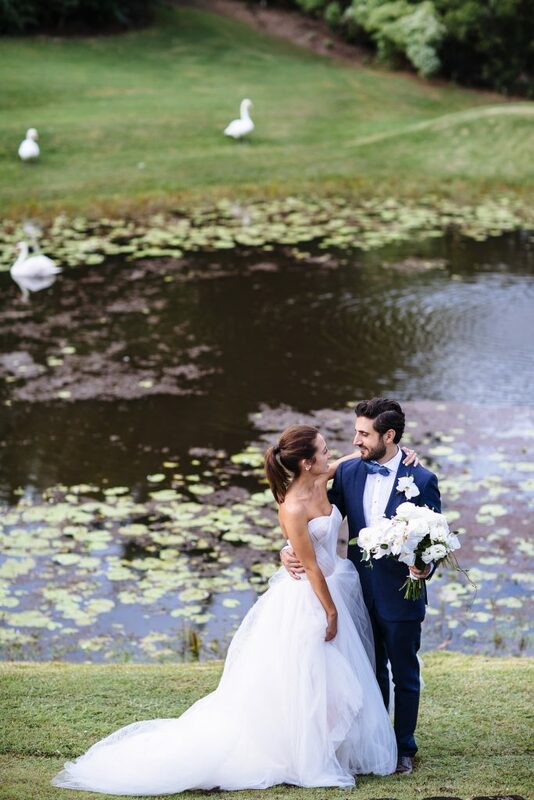 It was an absolute delight being a part of Tallie and Jorden’s gorgeous wedding day, it was filled with sophisticated modern wedding style.